You’re up in your aerial lift, performing your regular job duties. Everything is going as planned. All is right with the world – at least in your own little corner of the world, 40 feet or so up in the air. And then, your aerial lift decides to stop working. So much for a normal day at work! Non-working aerial lifts are just one of the many hazards you may have to deal with. Knowing what to do in this situation requires calm nerves, an understanding of your surroundings, and a solid training background. CertifyMeOnline.net can help with the training aspect. Our aerial lift and scissor lift training classes apply real-world knowledge to typical work-related issues. Let’s take a look at what actions you should take in this uncommon jobsite situation. – Worker(s) in the lift. A non-working aerial lift presents fall hazards and tip-over concerns for any workers present in the lift. Broken equipment that can’t move is a serious safety issue, especially during bad weather. – Workers on the ground. If an aerial lift tips over, workers on the ground can be harmed as well. – Terrain – wet and slippery surfaces can be extra dangerous when an aerial lift stops working. – Non-electrical overhead hazards – trees, bridges, etc. – Other equipment – especially at construction sites and other busy job areas. – Weather – as noted above, bad weather can make a non-working aerial lift even more dangerous. – Don’t panic. Keeping calm helps a lot! – Communicate with ground crew. Notify your co-workers immediately. – Ensure your fall protection equipment is attached. – If the boom lift or extension arm is high up in the air, don’t attempt to rescue yourself. – Alert any rescue personnel of overhead hazards, power lines, etc. These issues are only some of the things that can cause an aerial lift to stop working. With a strong maintenance program in place, you can avoid many of the issues that cause an aerial lift to stop working. 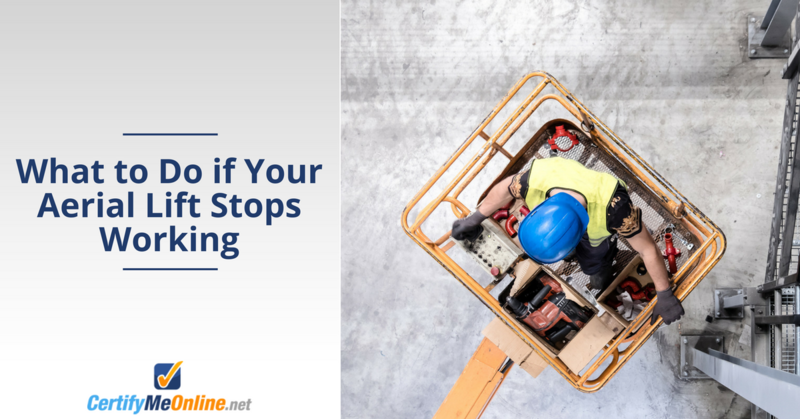 If you’re following standard OSHA protocol, your company’s maintenance policy acts as a useful preventative measure against aerial lift shutdowns. Some companies go above and beyond typical OSHA requirements for maintenance. It’s always a good idea to exceed OSHA recommendations for aerial lift and scissor lift maintenance. Minimum requirements are simply a baseline guide for your own maintenance plan. Non-functioning aerial lifts. Climate challenges when you’re 50 feet up in the air. Scissor lift clearance issues for indoor construction sites. And a thousand other issues. You never know exactly how your day as an aerial lift or scissor lift operator will go. There are a ton of unplanned situations you’ll probably deal with. But there’s one constant you can control: your training. We have the aerial lift and scissor lift training you need to avoid accidents, properly follow safety procedures, and stay up to date with OSHA guidelines. From dealing with aerial lift shutdowns to scissor lifts in any situation, we’re here to help you become OSHA complaint quickly and affordably. Our training is perfect for any aerial lift or scissor lift operator looking to become compliant. Sign up today! If you have any questions about our training programs, give us a call at (602) 277-0615. This entry was posted in Aerial Lift Training on August 23, 2018 by admin.